Tapan Kumar Gorain from Rishra, B.Sc Graduate. LABORATORY ANALYSIS QUALITY & ASSURANCE PRODUCATIONPROCESS S.. RESEARCH AND DEVELOP.. PROCESS & OPERATIONS.. VENDOR MANAGEMENT CUSTOMER AND TECNICA..
are one of expert skill area's of Tapan Kumar Gorain . 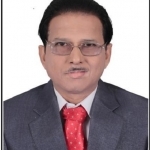 Tapan Kumar Gorain is working in Quality/Process Control industry.